Siemens has been awarded three further contracts for the supply and installation of 13 of its gearless turbines in Lower Saxony and Schleswig-Holstein. 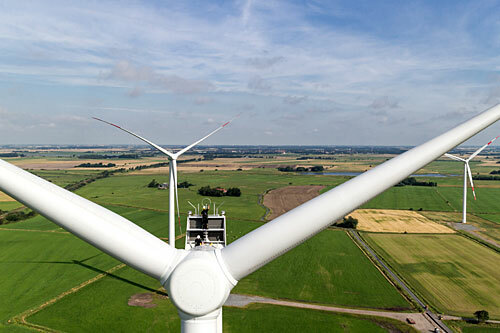 For the WPD Windpark Damme GmbH & Co. KG, Siemens will install and commission six units of the latest type SWT-3.3-130. A project in Karlum in the northern part of Schleswig-Holstein will receive seven units of the type SWT-3.0- 113. The deals include a long-term service agreement for 15 and 20 years respectively. Having made positive experiences with Siemens wind turbines, commissioned in 2016, WPD Windpark Damme GmbH & Co. KG is now expanding its Siemens fleet: According to plan, all turbines of its first project close to the A1 motorway were connected to the grid by the end of last year. The operator has now ordered six further turbines of the new type SWT-3.3-130 to repower an older project situated at Borringhauser Moor, and is offering citizens of the Damme community options to invest in the new project. The new turbines will be installed in autumn 2017 at a hub-height of 135 metres. In the framework of a full service contract, Siemens will care for smooth operation over a period of 15 years. The citizens’ wind park known as Bürgerwindpark Brebek GmbH & Co KG, situated in the northern part of Schleswig-Holstein, is building on the success of a previous project with Siemens wind turbines. For its new expansion project in the community of Karlum, the operator has ordered seven units of the type SWT-3.0-113. The community wind farm association which will operate the project now consists of more than 280 citizens of the three municipalities in the region. Siemens will install the wind turbines in the spring of 2017 on steel towers at a hub height of 115 meters. After commissioning in the summer, Siemens Wind Power will also be responsible for service and maintenance over a period of 20 years. Similar to the predecessor Brebek wind farm, the new Karlum project utilises the electromagnetic compatibility of the direct drive turbines to fulfill site-specific constraints to protect a neighbouring military radio station.